Real-time detection and alarm capabilities are insufficient or nonexisting. The set of available CBRN sensors, which can be used to detect contamination threats to water drinking quality in the distribution system, is very limited. The aim of several international projects that have been recently finished or are still in progress is the development of comprehensive event detection and event management solutions for drinking water security management and mitigation against major deliberate, accidental, or natural CBRN-related contaminations. The aims and results of three projects are briefly presented herein. The main objective of the project SMaRT-OnlineWDN (duration: 2012 – 2105; see SMaRT-OnlineWDN (2015)) was the development of an online security management toolkit for water distribution networks (WDN) that is based on sensor measurements of water quality as well as water quantity. The French-German cooperative research project consists of end users (BWB in Germany, CUS Strasbourg, and Veolia Eau d’Ile de France), technical and socio-economic research institutions (Fraunhofer IOSB, TZW, Irstea, ENGEES), and industrial partners on both French and German sides (Veolia, 3S Consult). In this project, the technical research work was completed with a sociological, economical, and management analysis. SMaRT-OnlineWDN combines applied mathematics, civil and environmental engineering, fluid mechanics research, and social science and economics in a multidisciplinary approach. The general system concept is sketched in Figure 2. The software solution relies on data treatment and assimilation from a sensor network of water quantity values (pressure, flow rate) and water quality values (e.g., chlorine residue, pH, conductivity, turbidity, and temperature). 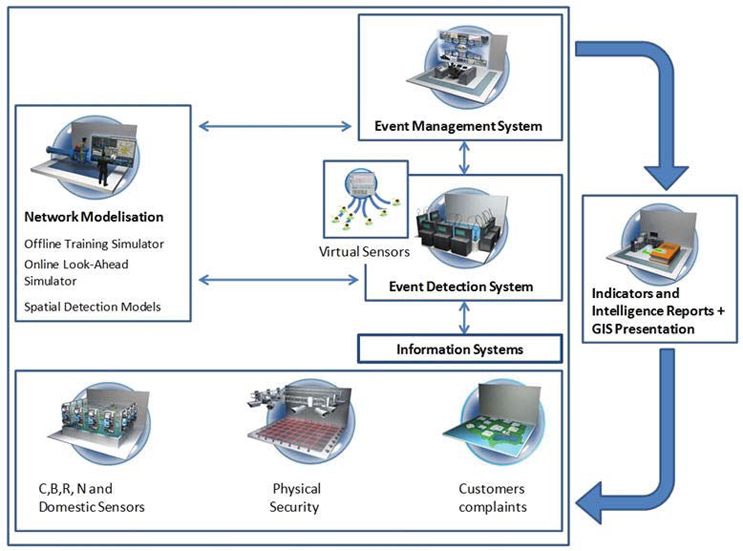 The core of the online security management toolkit consists of a grid of smart sensors in combination with an online simulation model. The boundary conditions of the network model are regularly updated by measurement data guaranteeing the compliance of the model with the observations. With this information, the online security management toolkit is able to reflect the current hydraulic state of the entire system. In addition, monitoring of water quality parameters supports the detection of biochemical contamination of the drinking water. Figure 1. In case of a toxic contamination of the water distribution network, the water suppliers will be supported by the SMaRT-OnlineWDN security management toolkit. Event detection and alarm generation: Enables a robust detection of changes in the water quality. A sensor data fusion module evaluates the data of water quality sensors. The module learns the normal water quality ranges and patterns from historical data. The online simulation model is used for plausibility, check-of-the-event detection. Optimal sensor placement: Enables the optimal placement of a defined number of quality sensors in a real-world network (hydraulic state, physical/chemical parameters). It enables the user (e.g., WDN operators) to find optimal locations for early warning detection systems (Propato and Piller, 2006; Deuerlein et al., 2010). Online simulator: Provides real-time, reliable flow, pressure, and water quality parameter values of the whole water network. The calculations are based on the available online measurement data of hydraulic parameters (e.g., inflow in the network, demand, flow, and pressure values) and water quality parameters. Enhanced water quality simulator: Provides more reliable water quality simulation results. In most of the actual available WDN simulation software tools (e.g., EPANET), a complete mixing of substances at junctions is assumed. Detailed experimental and simulation-based study of the transport of conservative substances in real-world water drinking networks showed that under various flow conditions the complete mixing assumption does not hold (Shen 2008, Braun 2105). The water quality models PORTEAU (Irstea) and EPANET-MSX has been enhanced so that the non-ideal mixing at junctions is considered. Online contaminant source identification and mitigation of risks: Provides the location (or at least candidates) of a contamination source. A backtracking algorithm that uses the data of historical measurements has been implemented. The merit of offline methods (e.g., Propato et al., 2007) and pseudo real-time ones (Preis and Ostfeld, 2011) has been studied and compared to the developed online solution method. 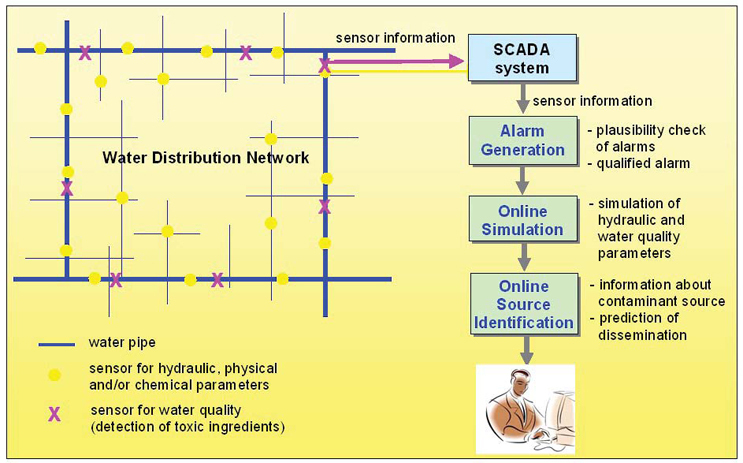 As a result of water quality sensor alarms, the possible localizations of the intrusion of contaminant can be calculated. Risk analysis and impact assessment: Risk analysis and impact evaluation (real impacts and perceived ones) will be performed for the three aspects of sustainability: environmental, social, and economical, combined with technical innovation. The SMaRT-OnlineWDN toolkit improves the observability of water quality and quantity in the distribution network in near real time. It acts as an early warning system as well as decision-support system in case of contamination events. Furthermore, it supports a better understanding of the physical and biochemical processes in the pipe systems — e.g., it is possible to use it offline for training of staff by use of simulation. Similar to the aims of the project SMaRT OnlineWDN, the European FP7 (“Seventh Framework Programme for Research and Technological Development”) project SAFEWATER (Oct. 2013 to Dec. 2016) aims at developing a comprehensive event detection and event management solution for drinking water security management and mitigation against major deliberate, accidental, or natural CBRN-related contaminations (see SAFEWATER (2016)). The comprehensive SAFEWATER solution, comprising enhanced near-real-time sensors, an advanced decision support system, online hydraulic propagation models, and an all-encompassing event management system are tested against several true-to-life usage cases (e.g., contamination of a municipal storage tank, contamination of a major water trunk line, contamination of a local supply line) using several families of contaminants such as organic compounds, toxic waste, and radioactive material. Trials and measurements of individual components of the system as well as the entire completed system are performed in special hydraulic test networks set up in three different water utilities. Applying the SAFEWATER system or any component thereof will enhance a water utility’s ability to rapidly detect a contamination event, analyze its repercussions using real-time hydraulic models, mitigate the damage using simulation tools and swift operating procedures, and deal more effectively with the event using a comprehensive event management tool. Figure 3 provides an overview of the structure of the SAFEWATER system. The key module is the Event Management System (EMS), which handles incoming events and provides decision support in case of a crisis (as well as for routine operations). The Event Detection System (EDS) breaks ground by detecting potentially dangerous constellations of water quality parameters currently undetectable. These constellations may indicate a contamination of the drinking water network, or a so-far-unknown operational effect. In case of an event, it is important to quickly provide decision support regarding the best mitigation measures (e.g., opening/closing of valves). In the SAFEWATER system the hydraulic and water quality state of the network is simulated in real time. In case of an event, online response tools can predict the spread of the contamination and calculate optimal measures to minimize the impact of the contamination. The simulators can also be used in an offline context in order to train the operational staff. Furthermore, the simulators are used in order to train the event detection system. Within the SAFEWATER project, enhanced CBRN sensors are also being developed to provide the ability for early detection of CBRN contaminations. The German-French project ResiWater (2015 to 2018) aims to develop tools to prepare water utilities for crisis management and enhance their resilience with regard to three specific case studies: (1) collapse of water distribution systems, (2) water quality deterioration, and (3) cascade effects among water, energy, and IT infrastructures. The aim of this project is to develop enhanced sensors and secure sensor networks, self-learning monitoring tools, robust simulation models, and vulnerability and resilience assessment tools for improving the security and the resilience of water infrastructures against major threats. The new developments will be investigated and evaluated by means of real-world use cases. The specific threats are defined by the partner water utilities Berliner Wasserbetriebe (Germany), EMS (Strasbourg, France), and VEDIF - Veolia Eau d’Ile de France (France). Additionally, experiments will be conducted at TZW (Dresden, Germany) with test platform facilities and also on the private water network at CEA/DAM (Gramat, France). The R&D work will be accompanied by socioeconomic studies ensuring, among other considerations, that the privacy and the freedom of the citizens are not compromised. Dr. Thomas Bernard is a physicist with a Ph.D. from the University Karlsruhe (TH). Since 1996 he has been a scientific assistant at Fraunhofer Institute of Optronics, System Technologies and Image Exploitation (IOSB) in Karlsruhe, Germany. Since 2007 he has led the research group Process Control and Data Analysis at IOSB. His main research areas consist of modeling, simulation, control, optimization, and data analysis of environmental processes, water infrastructures, and industrial processes. Braun, M.; Bernard, T.; Ung, H.; Pillier, O.; Gilbert, D. (2015): Model based investigation of transport phenomena in water distribution networks for contamination scenarios. International Conference on Computing and Control for the Water Industry (CCWI) 2013, Perugia, Italy. SMaRT OnlineWDN (2015): Project “Online Security Management and Reliability Toolkit for Water Distribution Networks”. Project website www.resiwater.eu. The project has been supported by the German Federal Ministry of Education and Research (BMBF; project: 13N12180) and by the French Agence Nationale de la Recherche (ANR; project: ANR-11-SECU-006). SAFEWATER (2016): Project “Innovative tools for the detection and mitigation of CBRN related contamination events of drinking water”. Project website www.safewater-project.eu. The project has received funding from the European Union’s Seventh Framework Programme for research, technological development, and demonstration under grant agreement no. 312764.